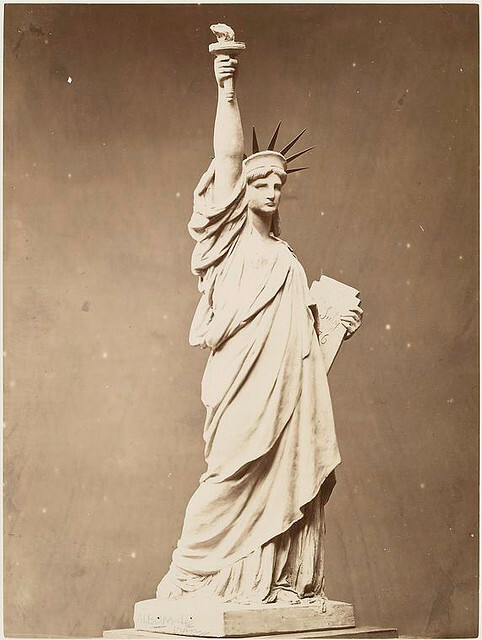 October 28, 2017 /Photography News/ 131 years ago today, the Statue of Liberty was unveiled in New York Harbor, when France dedicated the monument to celebrate "the Alliance of the two Nations in achieving the Independence of the United States of America and attests their abiding friendship." Model of the Statue of Liberty. Fernique, Albert -- Photographer. 1883. Source: Album de la construction de la Statue de la Liberte. Repository: The New York Public Library. Photography Collection, Miriam and Ira D. Wallach Division of Art, Prints and Photographs. 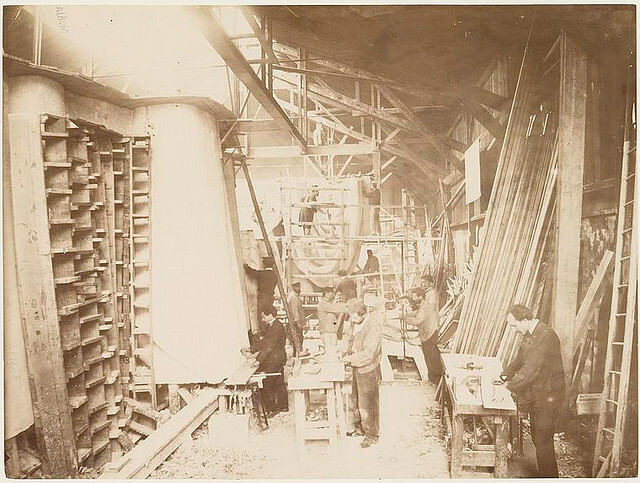 [Men in a workshop hammering sheets of copper for the construction of the Statue of Liberty.]. Fernique, Albert -- Photographer. 1883. Source: Album de la construction de la Statue de la Liberte. Repository: The New York Public Library. Photography Collection, Miriam and Ira D. Wallach Division of Art, Prints and Photographs. 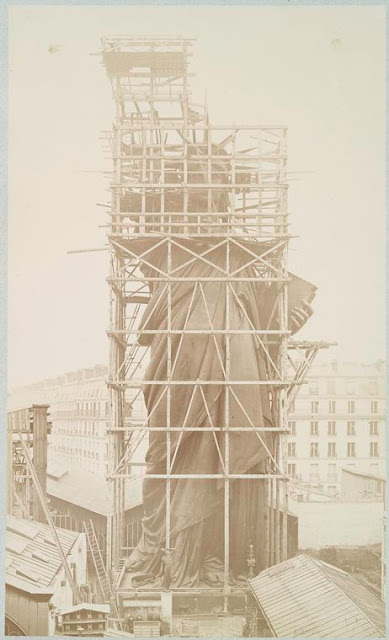 [Construction of the skeleton and plaster surface of the left arm and hand of the Statue of Liberty.]. Fernique, Albert -- Photographer. 1883. Source: Album de la construction de la Statue de la Liberte. Repository: The New York Public Library. Photography Collection, Miriam and Ira D. Wallach Division of Art, Prints and Photographs. 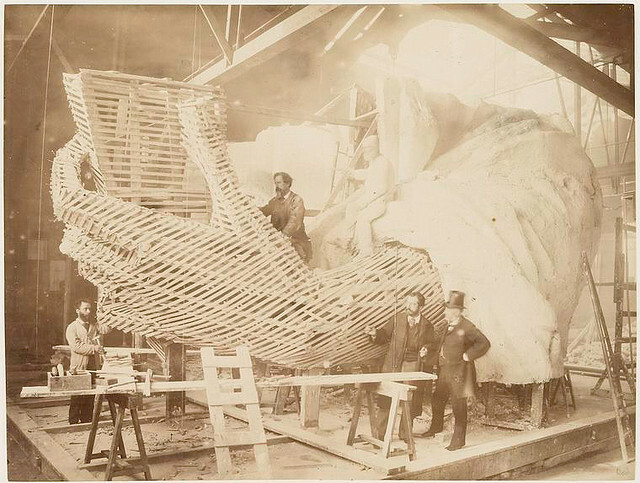 Men at work at the construction of the Statue of Liberty. Fernique, Albert -- Photographer. 1883. Source: Album de la construction de la Statue de la Liberte. Repository: The New York Public Library. Photography Collection, Miriam and Ira D. Wallach Division of Art, Prints and Photographs. 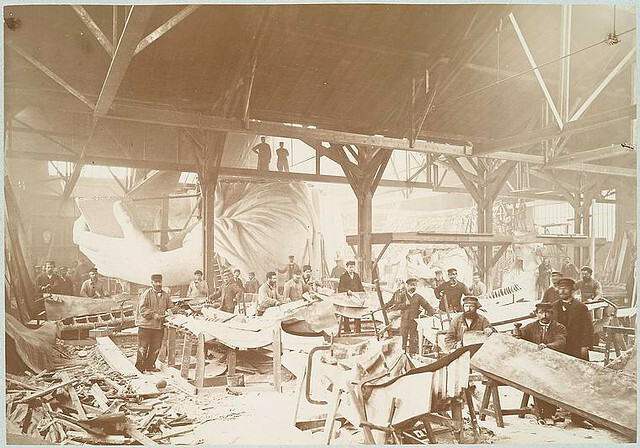 [View of the workshop, with models of the Statue of Liberty in the background.]. Fernique, Albert -- Photographer. 1883. Source: Album de la construction de la Statue de la Liberte. Repository: The New York Public Library. Photography Collection, Miriam and Ira D. Wallach Division of Art, Prints and Photographs. 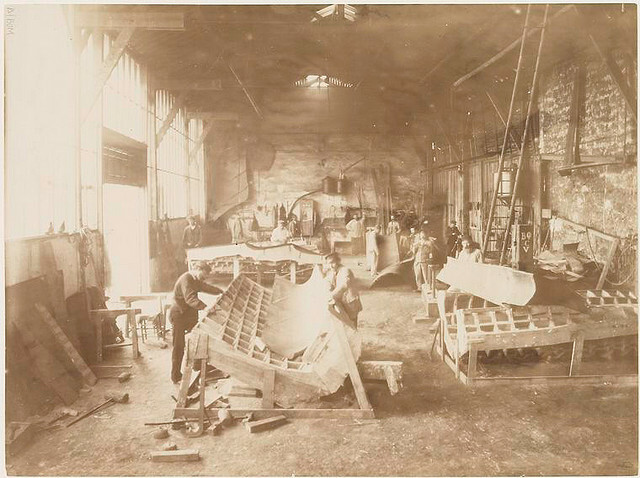 [Men in a workshop shaping sheets of copper for the construction of the Statue of Liberty.]. Fernique, Albert -- Photographer. 1883. 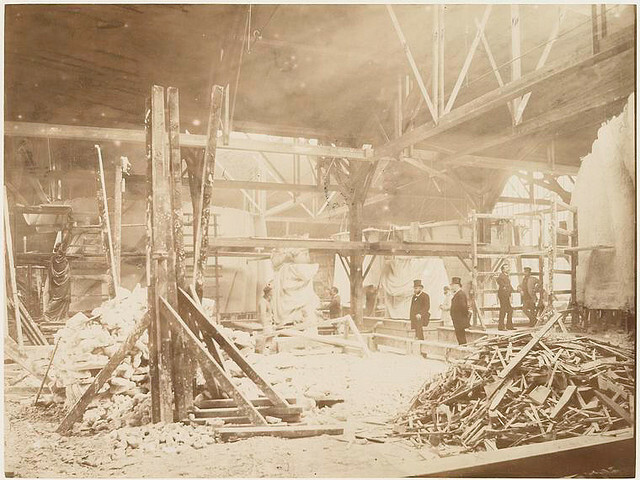 Source: Album de la construction de la Statue de la Liberte. Repository: The New York Public Library. Photography Collection, Miriam and Ira D. Wallach Division of Art, Prints and Photographs. 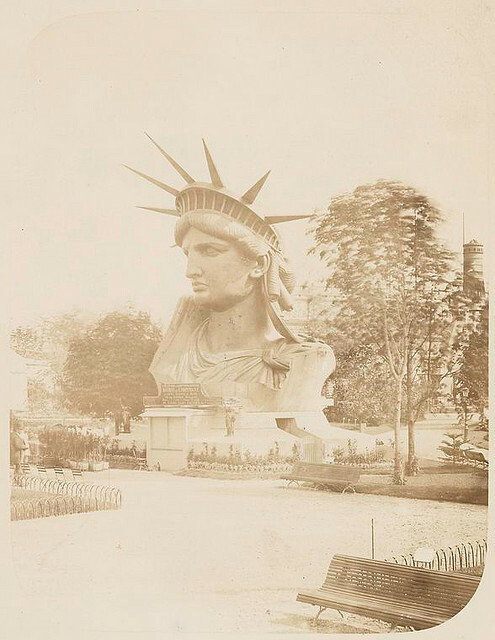 [Head of the Statue of Liberty on display in a park in Paris.]. Fernique, Albert -- Photographer. 1883. Source: Album de la construction de la Statue de la Liberte. Repository: The New York Public Library. Photography Collection, Miriam and Ira D. Wallach Division of Art, Prints and Photographs. 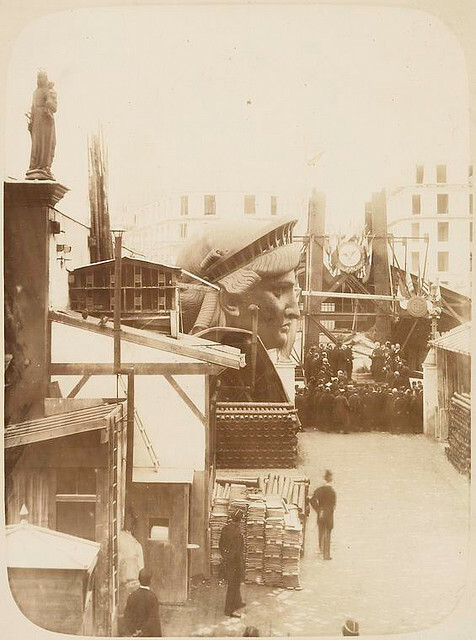 [View of the external area of the workshop in Paris, showing construction materials, the head of the Statue of Liberty, and a group of men gathered in front of the left foot of the statue.]. Fernique, Albert -- Photographer. 1883. Source: Album de la construction de la Statue de la Liberte. Repository: The New York Public Library. Photography Collection, Miriam and Ira D. Wallach Division of Art, Prints and Photographs. 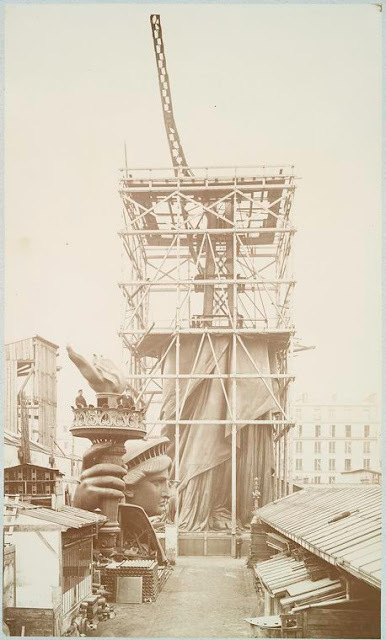 [Assemblage of the Statue of Liberty in Paris, showing the bottom half of the statue erect under scaffolding, the head and torch at its feet.]. Fernique, Albert -- Photographer. 1883. Source: Album de la construction de la Statue de la Liberte. Repository: The New York Public Library. Photography Collection, Miriam and Ira D. Wallach Division of Art, Prints and Photographs. history in photos. loved it! I am really pleased after going through your article. It's really informative and your style of writing is great. I will regularly follow your blog from now on. I am a blogger myself and I know how much hard work you need to put in to develop a niche audience. go through it and I am wishing you all a very happy new year 2017 in advance. IPL 10 Auction live stream Will Be Placed Here. IPL Is a Professional League For T20 Cricket Competition In India.